Butch Warren, bass; Billy Higgins, drums. As the first solo album by Herbie Hancock, this record will serve for many listeners as an introduction to the talents of a young and unmistakably promising artist who recently signed an exclusive Blue Note contract. For this maiden voyage as captain of a team, Herbie did not stint himself in the selection of crew members. Freddie Hubbard, of course, is an old Blue Note friend, familiar through his work with Art Blakey and other groups, including his own. Dexter Gordon is enjoying a major renaissance since his emergence during the past year via the Manhattan jazz clubs and his own Blue Note LPs. 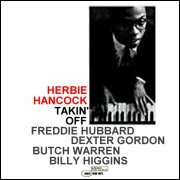 With the first-rate rhythmic support of Billy Higgins (who impressed me a couple of years ago with the Joe Castro--Teddy Edwards Quartet in Hollywood) and Butch Warren, Herbie was assured of "takin' off" in style. "Watermelon Man" (remember the 1938 Ellington record by that name? No connection) is a strongly gospel-infused 16-bar theme. Herbie establishes the mood immediately with his opening vamp: quarter note rest, two eighths, followed by eighth and dotted quarter-rhythmically a typical gospel figure-after which the horns state the theme, mainly in unison. Freddie's solo stays firmly in the mood of the piece: despite the occasional unpredictable excursions into sixteenth notes, the overall feeling is basic and earthy. After Dexter has successfully plowed another part of the same field, Herbie takes over for a solo in which, interestingly, one hears the echo of sounds that were a part of the Blue Note scene around the time of his birth-men like Albert Ammons and Meade Lux Lewis. Speaking of the composition, Herbie says: "In reflecting on my childhood I recalled the cry of the watermelon man making his rounds through the back streets and alleys of Chicago's south side. The wheels of his wagon beat out the rhythm on the cobblestones." "Three Bags Full" was so named because says Herbie, "Each of the three soloists plays out of a different bag. Also this is a line from Baa Baa Black Sheep, which makes you think of a shepherd, and in a way the tune does have something of the sound of a shepherd maybe way off in Baghdad or somewhere." The tune, a waltz, suggests something of the mood of Miles' group with Coltrane in the late 1950's, with Dexter's long flat tones (flat in terms of vibrato, not intonation) evocative of the earlier Trane. Herbie's solo here is beautifully executed in right hand single note lines, later easing into a chorded passage, with a left hand that is supplementary and never perfunctory. "Empty Pockets" ("I was in a sad financial state when I wrote this") is a moderato blues with long pickup phrases leading to an eighth and quarter note. Herbie returns here to the simple, funky groove of Watermelon Man, but this time with a straight blues rather than a gospel feel. "The Maze" is an ear-catching minor theme with one noteworthy point: during the first two of Herbie's three solo appearances (the one after the opening ensemble, and one between the trumpet and tenor solos) Butch and Billy improvise freely instead of playing time. "To me," says Herbie, "this not only added interest but allowed more rhythmic freedom." The tune, he points out, "seems to go along the bent paths of a maze, to which the final solution is never reached-notice that the performance doesn't have a real tonic ending." "Driftin'" as Herbie observes, has something of a loping quality in the whole performance. A 32-bar theme, it is stated by the ensemble except for the second eight, on which Herbie takes over. If Freddie's sound is softer and less brash on this track, there is a reason: he is playing fluegelhorn. Herbie stretches out for two choruses, again blending ideas and execution skillfully; notice especially the run at bar 14 of his first chorus, and the increased blues-consciousness of the second chorus. "Alone and I" is a ballad, in A. "I am very much interested in chord color in music," says Herbie, "and this tune displays much of what I have been working on in that vein." Dexter's pretty mood is well served by the attractive melody. Herbie rightly considers that this is the most interesting tune on the album and that it includes his best solo. Summing up his feeling about the session, Herbie concludes: "I was happy with the way the fellows worked with each other, and with me. I particularly like Dexter Gordon's solos on "Maze" and "Watermelon Man," and Freddie Hubbard's work on "Empty Pockets" and "Driftin'"